One way of dealing with the Aprilia Futura’s leaky clutch seal is to replace the whole slave unit with an aftermarket one. They usually offer reduced lever pull and claim greater reliability, though the standard slave can be fixed easily and at a fraction of the cost. Having tried an MPL one only to have it fail suddenly I’m not a fan and prefer the original, re-assembled using silicon grease. Since the unit is the same on many other Aprilias (and some Ducatis apparently) here are many different manufacturers of clutch slaves that fit. 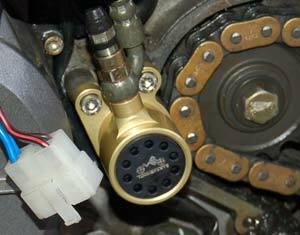 The pro’s and cons of replacement are covered on the clutch issues page.